The adoption of web push notifications as a communication channel is rocketing through the sky. Here are some key learnings from our iZooto journey. In this post we shall talk about the right approach towards this alternative communication channel. Web Push Notifications have brought a relief to marketers and developers globally. As many as 10 billion Chrome Push Notifications are being sent Everyday. There are multiple reasons behind the rocketing adoption rate. Subscriber acquisition rate is faster than any other channel of communication – 30X times faster as compared to Email. Chrome: Chrome requires you to generate a GCM Sender ID ( Now Firebase Sender ID ) and Server API Key. Read more here about how to generate one. Firefox: Firefox doesn’t tie subscribers with API keys, you can migrate your existing subscribers to a new platform easily with current implementation. Safari: Safari requires an APN certificate to be generated for push notifications. You need to be registered as a developer to generate these certificates. Registration cost itself is 99 USD. Nevertheless all the leading providers allow you to use their certificates. Given that Safari Push Notifications are only applicable for Desktop and a Safari has limited exposure, this often gets ignored. Nevertheless, to migrate you would need to get the Certificate and the keys. Check this to reach more about how you can generate APN certificate for your domain. Why is it important to use your own key: If you are using a third party platform to push notifications, this will give you the ability to migrate – either to a different more feature rich platform or your in-house platform if you develop one.
? Your end users, in such cases will be subscribing to https://yourbrandname.xyzserviceprovider.com and hence will receive notifications from https://yourbrandname.xyzserviceprovider.com and not https://yourbrandname.com. You essentially lose ownership of these users and can’t migrate these users to a new platform as these are not tied to your domain. Create a CNAME entry pointing it to sub-domain of service provider and insisting service provider on taking consents on your sub-domain. For eg: With ‘notify’ as a CNAME entry pointing to yourbrandname.xyzserviceprovider.com, subscriptions would be taken on notify.yourbrandname.com. With this implementation a customer stalkbuylove.com would take subscriptions on notify.stalkbuylove.com instead of stalkbuylove.izooto.com. You can create an https page for taking subscriptions – https://yourbrandname.com/notifications – white the rest of your site resides on HTTP. With this implementation, subscribers will directly be linked to yourbrandname.com. 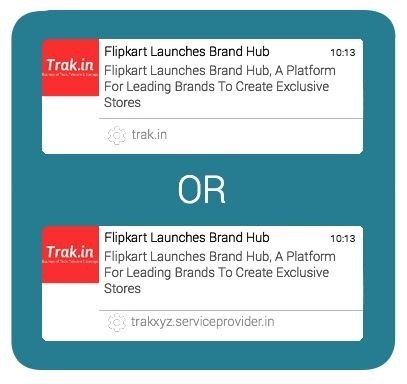 So, https://trak.in would take consents on – all subscriptions tied to https://trak.in domain. Subscription Requests on page load create a broken experience for the end user. It is critical to connect with the user, build trust, offer value and only then seek their consent for subscription. Notification delivery on Google Chrome can be a bit patchy at times, especially when the user’s device has limited connectivity. It is in these cases that a default notification is showcase to the end user. This creates a patchy experience for the end user, more than often confusing them, resulting in un-subscription. How can you avoid this ? There is little control that you exert over user’s connectivity but what you can ensure is define a default notification with a crispier communication. Do note that with the release of Chrome 51, Service-Workers are being phased out but it will take its own sweet time before users migrate to Chrome 51. For a bulk of users, web push notifications are new. They are yet to get accustomed to seeing notifications popping out of the desktop screen. It is for this reason, you should setup a simple welcome notification that can be pushed to the user right after they subscribe. This doesn’t have to be necessarily fancy – but just as a plain Thank You message will suffice! Details go a long way in creating delightful experiences. Creating delightful experiences is the only way to ensure that your users stick around with you. More on how to engage your users in the next post. About the Author: Vivek Khandelwal is Co-Founder and CEO of IZooto, a web push notification service provider. "Setting Up Web Push Notifications: The Right Way", 5 out of 5 based on 8 ratings.